Do you have bad habits? If so, you’re not alone. Most (all?) of us are guilty of something of which we are not proud. So, the question becomes, “if my behavior (thoughts, actions, etc.) make me ashamed, angry, and guilt-ridden why can’t I just stop? : The answer, of course, is not a simple one. This is because the answer is stuck in limbo between the neverending interplay between conscious and subconscious. It is important to understand three things: understand how and why habits form; things that trigger our bad habits, and how to kick them to the curb. In psychological babble, habit formation “is the process by which behavior, through regular repetition, because automatic or habitual.” In other words, habits are deeply entrenched within our brain’s neural pathways through what we repeatedly do – whether or not we are conscious of the fact. The more that the habit is repeated, the more the behavior becomes automatic. 1. Reminder: The trigger that initiates the behavior. 2. Routine: The behavior itself – the actions we take. 3. Reward: The benefits (real or not) we gain from the habit. 1. Reminder: The gym clothes laid out the night before. 2. Routine: An hour cardio and weightlifting session. 3. Reward: Feeling better physically and mentally. 1. Reminder: The bottle of wine atop the refrigerator. 2. Routine: Drinking to excess. 3. Reward: In the short-term, relaxation and fun – but it doesn’t last. The ‘reward’ is what defines a bad habit –as the reward slowly becomes regret and dissatisfaction. Though dissatisfied, and due to the structural and chemical changes of the brain, the habit becomes more involuntary and destructive. 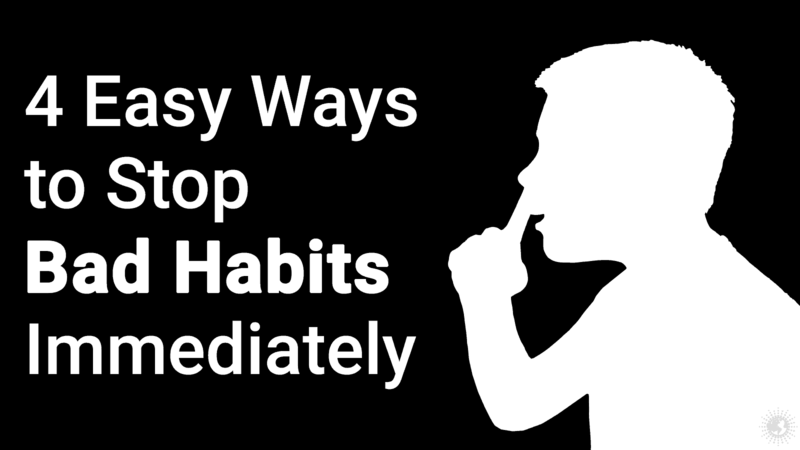 Here are four ‘simple’ steps for breaking a bad habit! What is it that you no longer want to do? Whatever this habit may be – procrastination, smoking, drinking, overeating, cursing, etc. – specify the habit you want to change. While identifying the habit may sound overly simplistic, it is nonetheless crucial. Habits are so powerful because they rarely enter our conscious mind. Labeling is a way of directing your shining your energy and attention towards behavior that prefers to operate in the shadows. Do you smoke? What kind of reward do you get from smoking? As a former smoker, this writer can say that stress relief is probably smoking’s biggest draw. The act of smoking takes one’s mind off of that annoying coworker, for instance, and induces a sense of relaxation. The problem with the ‘reward’ of smoking – and most bad habits – is that such pleasures often do not last. Going a step further, our reward for bad habits often turns to regret; regret produces stress, and stress has a way of reinforcing bad habits like smoking! Step three gets to the crux of the bad habit: its triggers. Identifying what triggers the bad habit – often a state of anxiety, fear, and stress – allows one to cut off the habitual impulse before it takes hold. Going back to the smoking example, the body is more likely to crave the relaxing effects of nicotine when experiencing distress. When we’re able to observe our inner state – in this case, distress – we are much less likely to engage in defeating behaviors that result from these states. Charles R. Swindoll is credited with the saying “Life is 10 percent what happens to you and 90 percent how you react to it.” This quote is most applicable concerning habits. When approached with an attitude of mindfulness, quitting a bad habit can be seen as a journey; a difficult journey to be certain, but a journey nonetheless. The reason is quite simple: we are our worst critics. 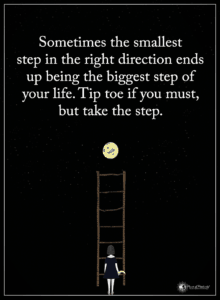 Our attitude – and how we feel about our attitude – will ultimately determine whether or not a habit is kicked. The point is this: do not try too hard. Relax and be self-aware. Practice calmness and embrace difficulty as a part of the process!